While a caravel was constructed in New York and then sent out eastwards exploring, I founded Chicago on the northwestern tip of the continent, with access to whales, copper, and yet another corn resource. The national epic is constructed in Boston, which now is my most productive city. Then the Angkor Wat gets built in Washington, and a great prophet constructs the Dai Miao, the Taoism shrine, in New York. Last but not least, Boston completes the hanging gardens. Finally, my caravel makes contact and finds Tokugawa of the Japanese! He also doesn't want to trade anything with me, though, without telling me why. The same was true for the Incans, which I found next. To make matters worse, the Incans demanded literature from me soon thereafter, and I caved in and gave it to them, hoping to cultivate at least some friends. Now that I had secured the whale resource, I decided to sign an open border agreement again with Greece for trading routes. Chitchen Itza was built in Washington, and suddenly I remembered to take a look into what civics I could adopt, which I had forgotten completely! And I had new options indeed and adopted hereditary rule (+1 happiness per military unit in a city, which should help with happiness), serfdom (faster working speed for workers), and pacifism. Then, both Incans and Greeks were willing to trade techs with me! Maybe it was because I had not adopted advanced civics previously, or was it just a coincidence? I traded three for three techs with the Incans, but unfortunately forgot which exactly - I only remember that the deal was slightly in their favor, but after the trade I had all techs they had plus a solid lead, so I didn't care. In 1210AD, Isaac Newton appeared, and this time I saved him for a golden age later. Inflation began to settle in now, and I began to build harbors, groceries, markets and banks everywhere to improve my income. Meanwhile, I noticed that Greece entered my territory with a stack consisting of a war elephant, a crossbowman, a swordman and two catapults. I hoped they were only hunting a lone barb unit in the west, and I was relying on the fact that if they declared war on me, their units would automatically be thrown out of my territory. No more sneak attacks against weakly defended cities deep in my territory! Alex wasn't hunting Barbs. I'm not sure what the sense of moving his stack through my territory had been, reconnaissance maybe - but in 1270AD, he declared war on me again. *sigh* The aforementioned stack advanced on New York, again pillaging villages on its way, and two war elephants and two swordmen appeared near Washington. This time, my military units consisted of five archers, two chariots, two macemen, three swordmen, four spearmen, and four warriors. This was a lot more than last time, but I had no catapults, and no good offensive units to attack the elephants with, to prevent them from pillaging. Alex pillages three tiles (ouch) and moves the catapult out of the forest to New York. That cat has to go! If the AI is smart enough to attack my defensive stack with it, I might lose the city! So a Combat I enhanced chariot (str 4.4) rides a sortie against the str 5 catapult and wounds it, dying in the process. Then, my second chariot kills it, and returns to the safety of the city. I feel the sacrifice was worth it; all I need to do is to hold out until reinforcements (from other cities, and upgrades) arrive! Another hamlet gets pillaged (cursed be you, Alex! ), but meanwhile my knight from Boston kills a crossbowman on his way to New York. I like the knight's "immune to first strike" feature! Next turn, the situation at New York gets interesting again. 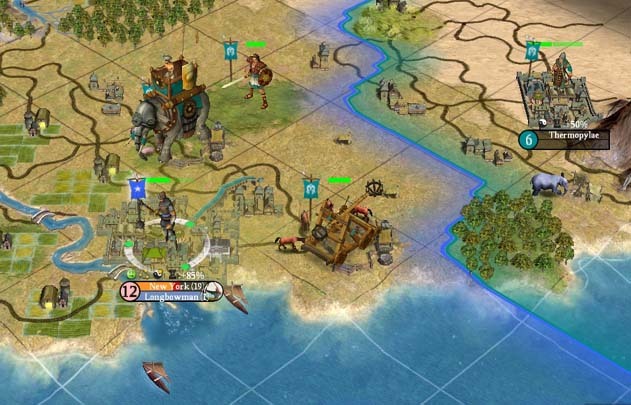 This strength 8 war elephant (+50% vs mounted units, +25% vs melee units) is scary, especially since there's another catapult near the city again. Additionally, a sword unit is en route as well, while I have a maceman, a swordman, a chariot, a spearman, a longbow and two warriors in the city. 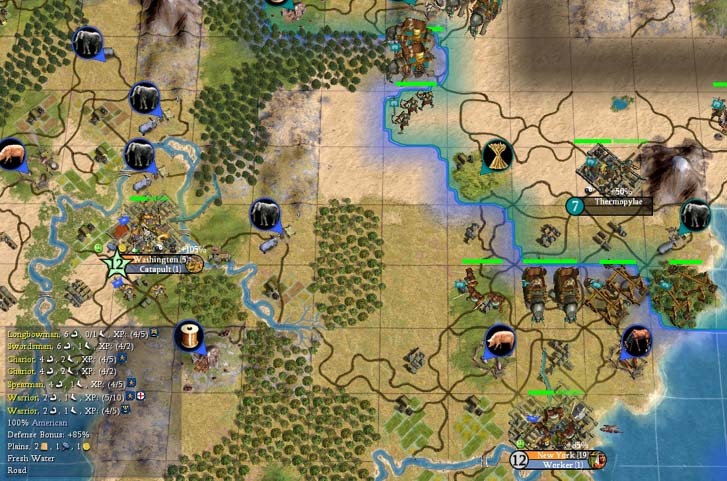 This is more than enough to defend, but I cannot afford to let the enemy units past the city to go onto a pillage spree in my lands! I don't know the AI good enough yet to be able to predict if it's that what Alex will be doing, or attacking the city. So the maceman attacks the catapult (8.8 vs. 6)...and dies. The sword has to finish off the catapult, and I fear to lose him if he remains exposed outside... but to my delight I see that combat won't end movement, so even slow units can retreat back into the city after a successful attack if there's a road on the tile! Wow, that is quite powerful. I cannot do much against the elephant right now, so I cannot prevent it from pillaging another tile. I upgrade a chariot to a knight though, to use it against non-elephant units during the next turns. Upgrading is quite expensive: 220 gold was needed for this! Next turn, a war elephant near Washington pillages a cottage! After killing two elephants with spearmen (+100% vs mounted units!) and some swordmen with my knights, Greece was willing to talk again in 1360AD, and I signed a straight peace deal, not wanting to annoy Alex for the rest of the game. Some turns later, I had finally managed to contact all civilizations: Greece, Rome, India, Japan, Incas, and Arabia. During exploration, I suddenly got the message "Congratulations! You have circumnavigated the globe. Your ships get +1 movement!". Cute! I decided to make friends with India, and signed an open border agreement with them and traded them ivory, dyes and pigs for bananas, clam and cows. This deal provided a much-needed boost in health to allow my cities to grow further. India was also the most advanced AI, and they actually had some techs I did not know, although overall I had a solid tech lead now. I had decided to go for a space victory in my first game. I wanted to explore the tech tree a bit, but didn't want to fight much, as I was already busy enough learning all the other things in this game, like what the buildings do, what improvements to make on which tiles, etc. So when in 1500AD I finally got a great artist, I used him together with my saved great scientist to spark my first golden age, to speed up researching! I liked the effect of the golden age, but unfortunately it would only last eight turns. 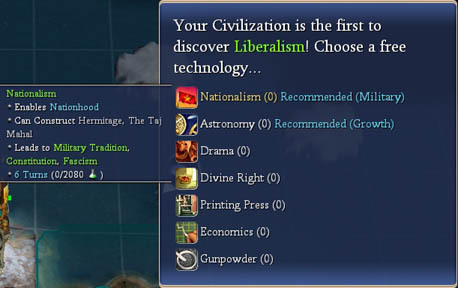 So when I managed to research liberalism first and was allowed to pick a free tech as a reward, I chose nationalism. Why? 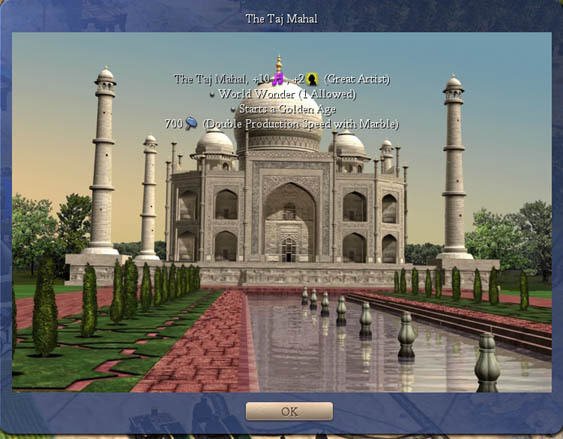 Because it allowed me to build the Taj Mahal, a nice great wonder which sparked my second golden age!